The Artist and their artworks and information relating to Open Days, Art Demonstrations and offers. A LESSON IN LIFTING YOUR ARTWORK. IF YOU LIKE IT, DRAW AND OR PAINT IT. STILL LIFE IS STILL IN VOGUE. Village house in the Charente Maritime. Watercolour on paper. Bearded Iris. Greeting Card. Watercolour on paper. Know your Artist – they are your friend. A Slight Change of View. I always enjoy drawing buildings, but, sometimes, as in this case, the main body of the castle wall, wasn’t particularly interesting, so, I took the liberty of adding two towers in the background, each with a conical roof. This gave more depth and dimension to the actual entrance and, it gave the illustration, ink on paper, more for the viewer to focus upon and to digest. Be flexible yet imaginative in your artwork. You are the judge of the final drawing or painting should look like. And on that last point, I appeal AGAIN, to all artists to remember to take a break and stand well back from your work, at least every 20 minutes. Otherwise you will will plough on regardless, often with quite disasterous results……..
Greeting Card. A red squirrel in falling leaves. Watercolour on paper. Another animal painting, watercolour on paper, depicting a red squirrel of which we have many, seated in the garden, eating an acorn. This artwork is now in a private collection. Greeting Card. Ink on paper. Black and white – always effective to my mind. Drawing and painting – a personal invitation to you. Watercolour on paper. Drawing and painting are therapeutic, creative, educational and above all, hugely enjoyable occupations. My Studio (just 35 mins. from Rennes) is open to visitors all year round and you are welcome to enjoy the 2 hour (1-2-1) highly acclaimed art sessions that I hold (indoors and outdoors) during the year. For further information, please fill in the form below and e-mail it to me. For artists and non-artists, there is residential accommodation too. Brittany – Professional Drawing and Painting Courses. Do you want to master the skill of making quick and accurate drawings and paintings? Or do you long to create a truly superb work of art? As a working Artist-Painter, I have many years’ experience ( In Ireland and in France) of teaching people how to produce lst class illustrations and paintings – in all fields and in all aspects of drawing and painting mediums and materials. Although I specialise in one-to-one Professional, Art Personal Tuition, I also hold a number of challenging Open Days (limited to just 4 persons) which comprise a Professional Art Class in the morning and in the afternoon, the students are given the time to unleash their creativity and to create a wonderful work of art of their own. The art of drawing is somewhat diminished by the use of CAD. or if you like, computor aided design. And less and less people alas are using sketch pads as a result, preferring to let the computor do their artwork – which isn’t really feasible! The nuances of the weight of application of the drawing implement, is so personal and can reveal to the viewer the relationship of the artist to the work, a task as yet not possible otherwise. However, you the reader or as an artist, will realise that some drawings, even very good work, may need a tiny splash of colour to bring the drawing to life. Using sepia or carré sanguine, is one way of uplifting even the simplest of artworks, as the warm hues of these colourants, in themselves, add life to an illustration. The other way, is as shown here, to just put in a minute morsel of colour, in this case in the kitten’s eyes – to give the work a vibrancy it would otherwise not have. If you have an illustration or a sketch that you think could do with an “uplift” why not try adding that vital touch of colour and sit back and admire the result. Thank you for reading this and if you have any queries about this or other features on my blogs at http://www.annedalton.org please contact me and remember to join me in my free Open Days. BUILDING AN ARTWORK FROM SCRATCH. Having been trained in the old-fashioned way – I know that building an artwork from scratch, although a slow process, can have very satisfactory results – for the artist and the viewer/buyer. 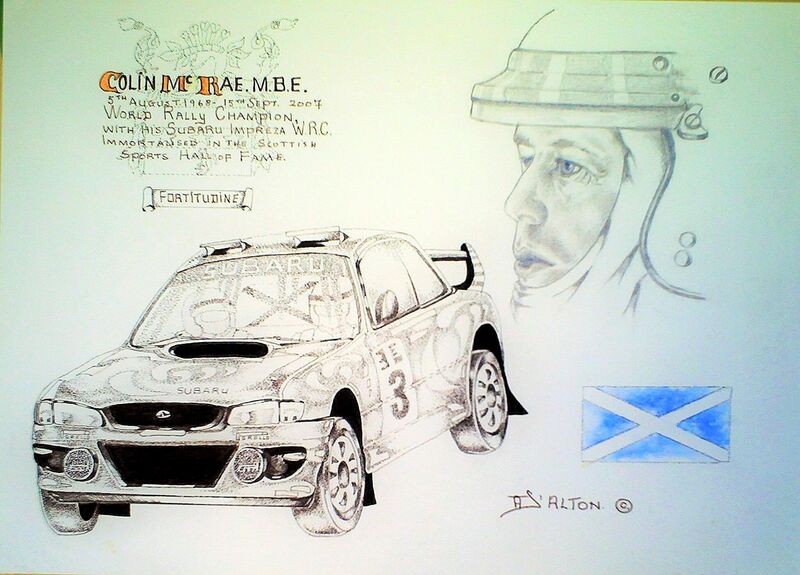 This particular Motoring Artwork depicts the late, amazing, Scottish Rally Driver, Colin McRae, MBE. World Rally Champion, with his Subaru Impreza WRC. To complete the artwork, I have added in two further details, one, the Family Crest overwritten with a short written script and the other, the Flag of Scotland. It took two months plus to complete this artwork and I hope you enjoy it. When you paint a subject you understand, it tends to look good. 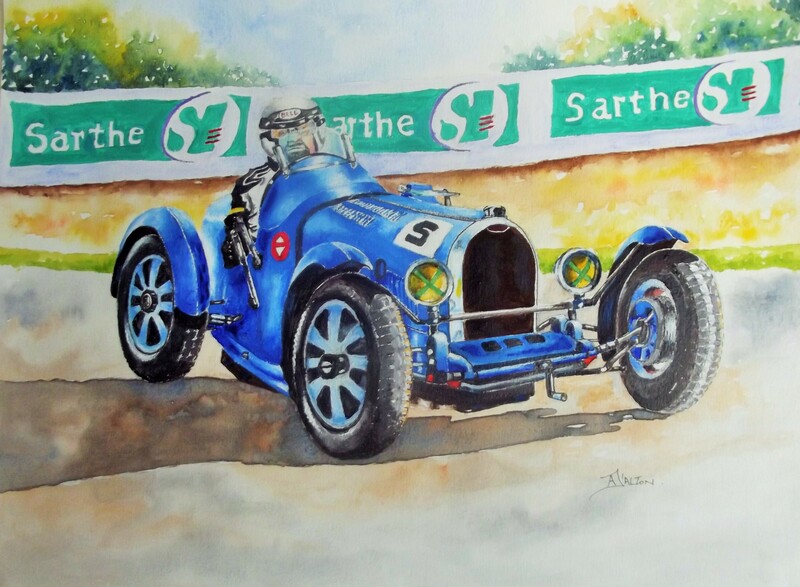 And I like the results of this watercolour, featuring the wonderful Bugatti 35B, shown here, cornering hard at La Sarthe corner at Le Mans. I CAN’T FIND ANYTHING TO DRAW OR PAINT. Believe it or not, I have actually been informed thus, by students – students who didn’t know that such a statement is anethema to me. 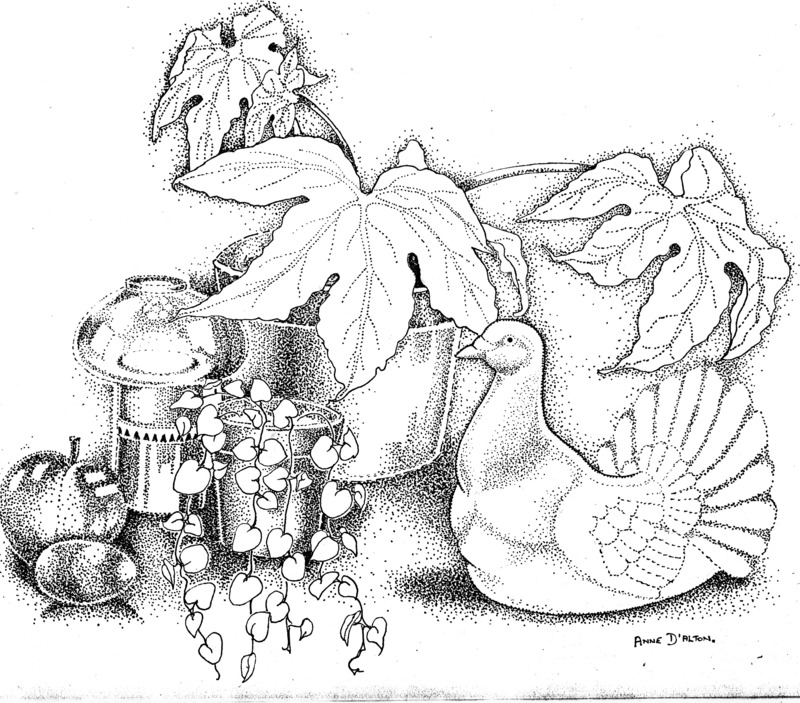 So why not try a simple exercise to show just what you can do, with simple items, for example a scarf wound about a water jug (now use your imagination…) starting with a pencil illustration, then a crayon artwork, next a gouache painting and finish by painting your subjects as a watercolour artwork. Limit the size to A4 and e-mail me your favourite with a brief description, and I shall feature the best five on a future blog. KEEPING YOUR ARTWORK SIMPLE YET EFFECTIVE. A problem seen particularly with still-life studies, is that of overcrowding. These boots are made for racing. 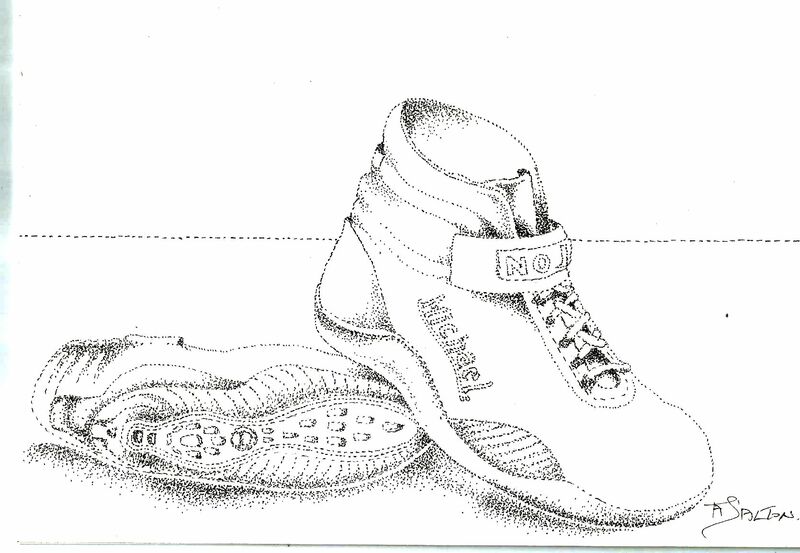 This work has been drawn in ink on 180 gm paper and the title of this artwork is ” These boots are made for racing”. A simple tip for Acrylic Artists. A frog-filled pond. Watercolour on paper. DRAWING ON YOUR ARTI… on ART IS FOR ENJOYMENT. Fabulous Art Classes & Courses in Brittany, W.France. Breton longere Acrylic on board. 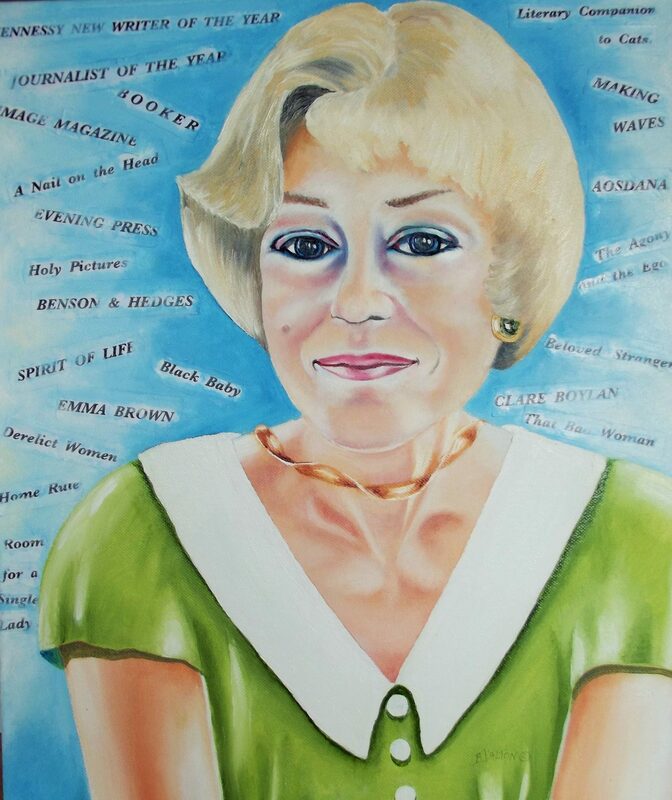 Welcome to my web-site:- www.annedalton.org for information on artworks, posts, photographs, blogs, Open Days and free, art demonstrations, etc.